The way you live your life is all about who you are. the best way to achieve a healthy lifestyle according to your type. Are you an “in-the-moment” type person or a “what-might-be” type person? Are you a “diet-starts-on-Monday-morning” type person? Do you make decisions from your head or from your heart? 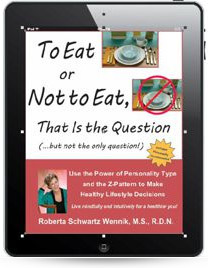 Do you eat according to a plan? Are you uncomfortable with writing down everything you eat? Will you accept a last-minute dinner invitation? This isn’t just a book for your type, it’s a book about all 16 types. 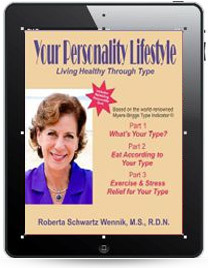 Find out not only how each type deals with losing weight, exercising and learning how to de-stress, but also your own type. Discover your type and that of 15 other types and what that means for. Discover and select the right diet plan for your type. Just how much food does your body need? What will it take to lose the weight? Do you need a structured plan? Do you prefer to be more flexible and spontaneous, finding structure too confining? Discover how to get the complete package of health. The layout is logical and useful. (I’m an INTJ – when you read through the type descriptions, you’ll understand why I use those words rather than “The content is inspiring,” even though both are true.) You can skip the advice for other types and hone in on your own prescriptions. But I recommend you spend some time learning about the other types, it really gives you insight into your friends and family. I use the Myers-Briggs diagnostic frequently in my job to help executives understand their decision making processes and communication styles. I loved seeing this new application. book was absolutely fabulous! Thank you for your contribution in this field. There are so many comments I could make, but I gave a stab in the two below. Steve Martin said, “I’d do anything to look like him, except exercise and eat right.” (A quote from the book. )Over the years, I’ve read a lot of books about weight, eating and exercise. But I never come across one like this! Who expects to learn about your personality type in a fitness book? But what a help it is! How a person handles life, what motivates her, what keeps him going–it’s all influenced by our personality type. I learned a lot about myself and how I’m put together. Of course, the type of change we’re focusing on is weight loss–and the general health of our bodies. Setting goals and keeping motivated are areas the author handles well. Not all types should try to use the same methods. I learned why people lose weight on high-protein diets–as well as on high-carbohydrate diets. But I found out better ways than both of these. I learned how to eat out safely, what to order and what not to order. I learned what types of exercise my personality type most enjoys and will stick with. I learned why coping with stress is crucial to keeping off the weight. We want to feed our bodies, not our emotions. Most of what I read had to do with the nuts-and-bolts of food and exercise. How to be motivated and committed to make the choices I need for growth and real change–so that the weight lost becomes permanent and healthy. This is no lightweight, fluffed-up set of books. It took me a long time to get through–because there was so much I had to highlight and underline. None of it was dry, none of it useless. They were packed with solid, tasty nutrients. 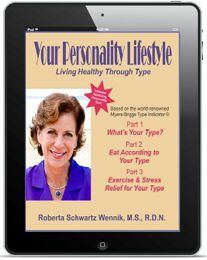 As a National Certified Counselor and someone who has tried almost every diet from Cabbage Soup to the Zone, I was doubly intrigued by the title of Roberta Wennik’s book, Your Personality Lifestyle. I was already familiar with the Myers-Briggs Type Indicator but had never thought to apply it to weight loss. Wennik divides her book into three parts. 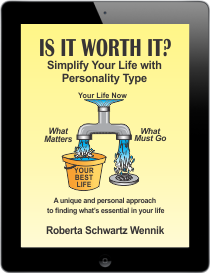 In Part One, she includes questionnaires so that readers can identify which of the 16 personality types they are. She then gives an excellent description of each of the types. For each, she outlines assets, attributes, challenges and stressors. For example, Wennik says my strength as an INFJ is the ability to plan ahead. Where I fall down is minding the details. That sounds about right. She suggests that someone with my type should not count calories but instead follow basic guidelines that allow for some flexibility and variety. Preparing a list of rewards other than food for meeting intermediate goals will help keep me on track. Wennik concludes with an impressive list of resources in print and on the web. In Part Two, Wennik outlines four different diet plans and advises which plan works best for which type. Four of the plans are familiar. Using The Portion Control Plan means learning what actually is a normal portion, not the “supersize” to which we have become accustomed. Even simpler, Wennik says just eat half of what you would normally eat or be served at a restaurant. The Instead Plan entails choosing better alternatives than what you have been eating. For example, choose toast with jelly instead of toast with butter or whole wheat in stead of refined pasta. Eating only when you’re hungry Wennik calls The Intuitive Eating Plan. If only it were this easy to avoid eating when bored, tired, angry, etc., etc., etc. Either the balanced approach of the MyPlate or a higher protein option can be used on The Choice Plan. Drawing the Line on Calories, Carbs, and Fat is Wennik’s elaborate, patented monitoring system that graphs calories, carbs, and fat eaten. Part Three is titled Exercise and Stress Relief for Your Type. Wennik does address these aspects but also includes a few cognitive therapy techniques, a Jungian look at the various types’ shadow sides, and quite a bit of information on nutrition. This trilogy is well-researched and very thorough Most of the information will not come as a surprise to anyone who has ever read a diet book. 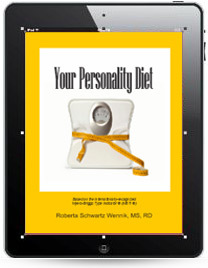 Looking at it through the lens of personality types, however, is new and may just be enough of a twist to lead to success in losing weight.